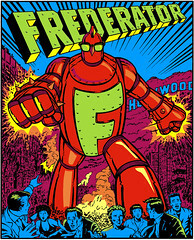 The Frederator Studios Blog: My friends. Postcards, Series 5. Most people are going to confused getting these cards from a cartoon studio. When I first figured out Photoshop I started rummaging around looking for source material to play with. These childhood pictures of my sister and our neighbors stood out as some of my favorites, because we're still lucky enough to be great friends. The one on the left is Susie & Frank Olinsky, me, and my sister Leni having a picnic lunch. Aside from our lifelong affection, Frank and I have had the luck do some special work together (Frank and his partners designed the world-famous MTV logo). And on the right are our other next door neighbors: Lisa Fenton, me, Hazel Dunnigan, Leni, William Dunnigan, and Lori Fenton (the photo is courtesy of Will). Will and Hazel run the printing company that actually produced this postcard series; Lisa's a pharmacist and Lori's in retail outside San Diego. We all see each other occaisionally (Leni, Lisa, and Hazel travelled to Paris together recently), but not often enough.